...the new range topping X3 model runs the same driveline as the recently introduced X4 M40i M Performance. These include two diesels in the form of the £38,880 xDrive20d and the £44,380 xDrive30d. However, BMW plans to widen the range with additional petrol models, including the xDrive20i and xDrive30i in early 2018. First introduced to the BMW line-up in 2003, the X3 has captured over 1.5 million sales worldwide, including 616,000 for the first generation model and 924,000 for the second-generation model. 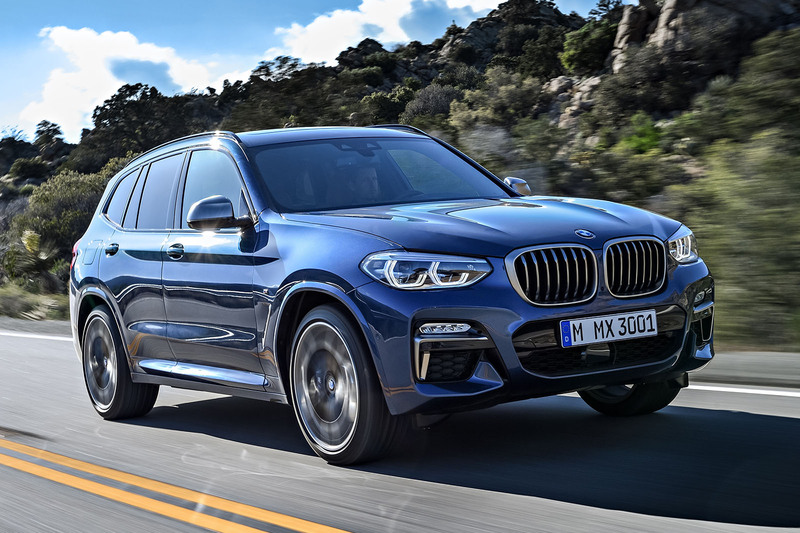 BMW has reacted to increased performance SUV competition from its premium brand rivals by crowning its third-generation X3 line-up with the new 355bhp M40i M Performance. Set to rival the Audi SQ5 and Mercedes-AMG GLC43 at a price of £51,280, the new range topping X3 model runs the same driveline as the recently introduced X4 M40i M Performance in a move that endows it with a claimed 0-62mph time of 4.8sec and top speed of 155mph. Revealed here for the first time ahead of a start to UK deliveries in November, the X3 has been extensively re-engineered for 2017 with a new platform that forms the basis for a incremental increase in dimensions, a further increase in interior accommodation and a reduction in kerb weight over the outgoing second-generation X3, which first entered showrooms in 2010. Corresponding upgrades to the new SUV’s electrical system also see the adoption of a range of contemporary driver assistant systems, including the latest generation of BMW’s active cruise control and driving assistant plus package, which incorporates both a lane change assistant and lane keeping assistant with side collision control. 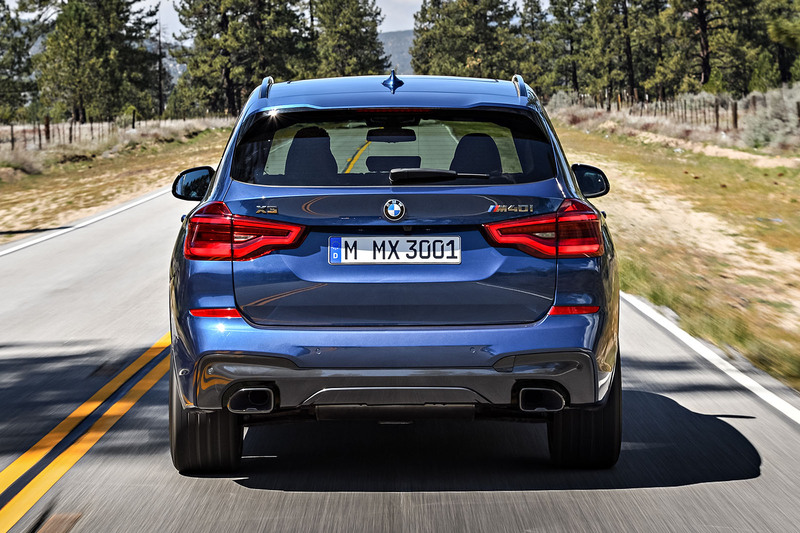 Headed by the new M40i M Performance, the new X3 line-up initially consists of three models, including two diesels in the form of the £38,880 xDrive20d and the £44,380 xDrive30d. However, BMW plans to widen the range with additional petrol models, including the xDrive20i and xDrive30i in early 2018. Further variants are under development, including a new plug-in petrol-electric hybrid touting X3 xDrive40e and a full electric X3e – the latter of which is set to arrive in 2020 as a rival to the likes of the upcoming Jaguar E-Pace and Telsa Model X. At 4716mm in length, 1897mm in width and 1676mm in height, the new BMW is 61mm longer, 17mm wider and, in its most sporting M40i M Performance guise, 16mm higher than its predecessor. By comparison, the recently introduced second-generation Audi Q5 stretches to 4663mm in length, 1893mm in width and 1659mm in height. According to Luk, the increase in dimensions was driven both by customer feedback for greater interior space together with the need to further distance the new X3 from the smaller second-generation X1 launch in 2016. Sporting a bold new front end with a prominent kidney grille and a heavily contoured bonnet with greater structuring than the outgoing model, the 2017-model-year X3 will be offered in three trim variants in the UK. The SE receives LED headlamps and tail lamps as standard, together with aluminium roof rails and 18-inch wheels. Above it is the xLine, which gets a aluminium grille highlights, more rugged looking bumpers and off-road focused 19-inch wheels. The M Sport features its own unique bumper design, optional blue-painted brake calipers and more sporting 19-inch wheels. 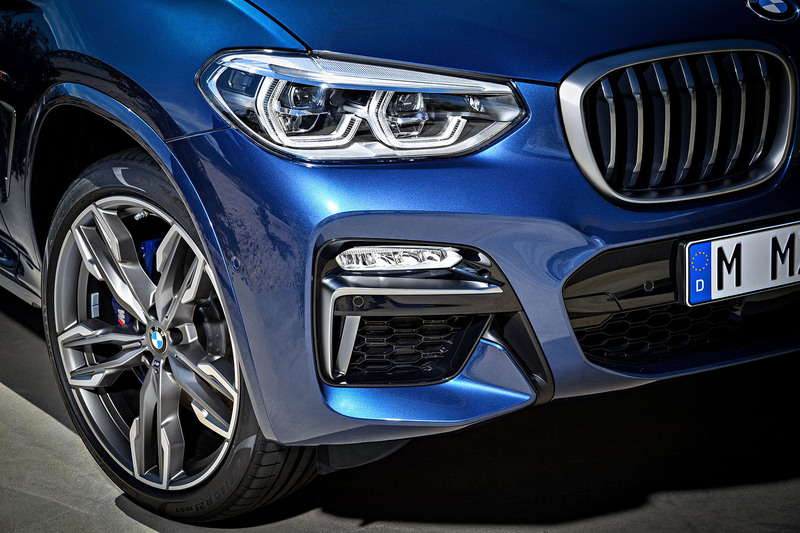 The top-of-the-line M40i gets its own individual look with optional 21-inch wheels. Based around BMW’s CLAR (cluster architecture) platform, the new BMW also receives a 54mm longer wheelbase than the second-generation X3 at 2864mm. The longer wheelbase has led to a subtle shift in weight distribution, which is put at a claimed 50:50 front-to-rear. Although it has grown in size, the added use of light weight metals and alloys, including hot formed high tensile steel within the floorpan and other load bearing areas of the body structure as well as aluminium for the bonnet and doors, has resulted in a 55kg reduction in kerb weight when increased standard equipment levels are taken into account, according to BMW, with the new entry level X3 xDrive20d tipping the scales at 1750kg. Despite the increase in dimensions, including a larger frontal area, BMW says extensive wind tunnel development has netted the X3 a class leading drag co-efficient of 0.29 – an improvement of 0.03 on the old model, which boasts a figure of 0.32. Drag reducing measures include louvers within grille that open and close depending on the cooling requirements of the engine, more extensive underbody cladding and a sizeable spoiler atop the tailgate at the rear to smooth air flow over the rear. Although the new SUV sports air breather elements at the trailing edge of the front wheel arches they are only for stylistic effect and do not perform any aerodynamic function. As part of efforts to provide the latest X3 with more up-market qualities than its predecessor, BMW has also focused its engineering efforts at enhancing refinement. As well as receiving greater sound deadening material within its new platform, the 2017 model features a windscreen with so-called acoustic glass that is claimed to bring a dramatic reduction in wind noise levels at speed as standard. The same glass is also available as an option for the front side windows. Inside, the interior is completely restyled with many elements mirroring the focus on hexangonal shapes and beveled edges seen within the exterior. Up front, there’s a new higher quality dashboard closely modeled on that used by the 5-series featuring a free standing infotainment monitor for the first time. Reacting to customer feedback, BMW has created additional oddment storage, including the incorporation of larger bins within the centre console and door pockets that accept one-litre bottles. Among the more contemporary options is a 12.3-inch digital instrument display, a head up display unit with multi-colour graphics and a 10.2-inch infotainment monitor – the latter of which boasts standard touch control, but can also be ordered with conversational speech and gesture control function. The boot capacity remains the same as before at 550-litres, extending to 1600-litres when the standard 40:20:20 configured split-folding rear seat is stowed. BMW has confirmed the new X3 will be offered in three models from the start of sales, with buyers given the choice of a single petrol and two diesel engines in combination with either a standard six-speed manual or eight-speed automatic gearbox along with the latest version of the German car maker’s xDrive four wheel drive system and BMW’s Driving Experience Control function that allows the driver to choose between varying driving modes as standard. At the head of the line-up, the X3 M40i’s turbocharged 3.0-litre in-line six-cylinder petrol engine delivers 355bhp and 369lb ft of torque. In combination with a standard eight-speed torque converter equipped automatic gearbox and an xDrive four-wheel drive system featuring unique software settings for what BMW describes as rear biased delivery of drive, it provides the Mercedes-Benz GLC43 rival with a 0-62mph time of 4.8sec and limited 155mph top speed in combination with combination with combined cycle fuel consumption of 34.5mpg and average CO2 emissions of 188g/km. Among the completion for the new performance based X3 model is the Audi SQ5, which runs a turbocharged 3.0-litre V6 petrol engine developing 349bhp and 369lb ft of torque. Other rivals include the Mercedes-AMG GLC43, whose turbocharged 3.0-litre V6 petrol engine kicks out 362bhp and 383lb ft of torque. The new X3 performance leader will be joined from the outset by two diesel models in the UK. Included is the X3 xDrive 20d, which runs the latest evolution of BMW’s turbocharged 2.0-litre four-cylinder common rail diesel engine allied to a standard six-speed manual gearbox and standard xDrive four-wheel drive. With 187bhp and 295lb ft of torque, it provides the initial entry level X3 with 0-62mph acceleration in 8.0sec and a 132mph top speed as well as combined consumption of 56.5mpg and a CO2 emission figure of 132g/km. Rounding out the initial line-up is the X3 xDrive30d. It receives BMW’s widely-used turbocharged 3.0-litre in-line six-cylinder common rail diesel engine tuned to deliver 261bhp and 457lb ft of torque. This is sufficient for a 0-62mph time of 5.8sec and 149mph top speed, while providing combined consumption of 49.6mpg and average emissions of 149g/km. Shortly after launch, BMW will also add a further petrol engine to the new X3 line-up. The turbocharged 2.0-litre four-cylinder unit delivers 181bhp and 214lb ft in the X3 xDrive20i and a gutsier 248bhp and 258lb ft in the X3 xDrive 30i. The same engine is also earmarked to power a rear-wheel drive X3 sDrive20i model, though it is not planned for sale in the UK. BMW is already taking up the dynamic qualities of the new X3. Its newly developed suspension retains a combination of double wishbones up front and a five link arrangement at the rear, but efforts have been made to reduce the unsprung masses through the adoption of aluminium swivel bearings and hollow anti-roll bars. Further changes are focused at the xDrive four wheel drive system, which receive a more rear biased delivery of drive. Buyers can opt for a sports suspension that forms part of the M-Sport package. It offers a firmer spring and dampers as well as beefed up anti-roll bars. There is also a dynamic damper control option with electronically controlled dampers. Have a search on Google for the N54 engine in the USA. Try with keywords such as "Lemon" or "fuel pump" or "injectors". BMW had to extend out the warranty in the US for this engine to 10 years, and still they're failing costing owners thousands. Now look to what they're doing for UK customers of the N54 and sister engine, the N53 (the non-turbo version). Absolutely nothing. BMW have let down owners worse than VW. You seem surprised? Not me. Just look at the residual values of their cars and the available deposit contributions to shift them as the retailers fight harder and harder for increased volume. That should tell you all you need to know. Even the brand new 7 Series is available with a £24K deposit contribution - YES £24K!!! Garbage for those with brains stuck in 1987 when BMW were the best cars around. And that is no understatement - they were brilliant. 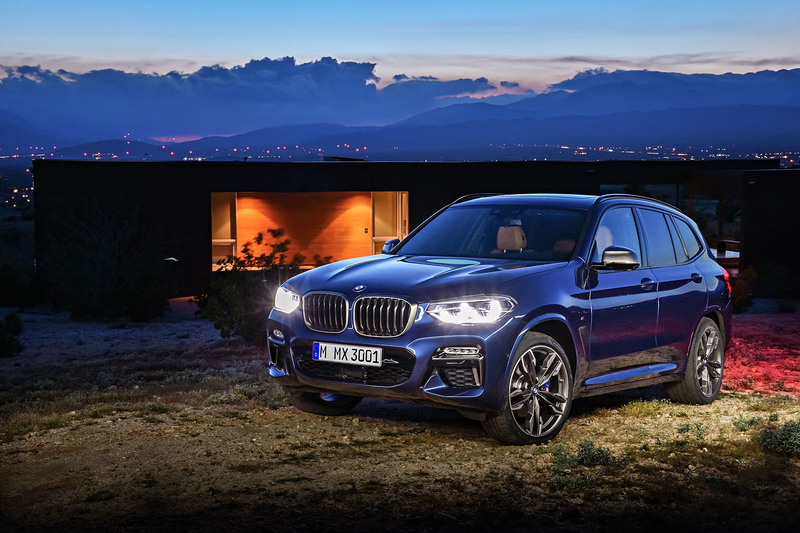 used the following headline for this car: "New BMW X3 SUV revealed: Munich's photocopier is working fine." Sums it up rather well. Totally agree Bob. Maybe Autocar published images from he old X3. Looks exactly the same as the current one. "It is known within the design team as the rugby player in a suit"
"Inside, the interior is completely restyled with many elements mirroring the focus on hexangonal shapes and beveled edges seen within the exterior"
The design is nowhere as fancy as the fanciful words. The headline should have read: More of the boring same. To keep on topic here,seems to me we are getting pushed towards SUV's with Diesels in them...? Why does BMW bother when the F Pace and Velar are around? On looks alone, both inside and out, this new X3 is simply miles behind the attractive and utterly desirable styling of a Velar, F-Pace or Stelvio. The X3 not only looks dull (as per the BMW norm) but it neither looks even remotely attractive or fresh and it already looks old. This won't date very well. And when it comes to on and off road, it won't have a chance, the Jaguar will whip it on the road like every current Jaguar does with BMW, while it's a given that the Velar will simply trump it off road (and probably on the road too). And as others have said, reliability will be awful as is the case with current BMWs while heavy discounting simply, poor residuals and oversupply highlights the fact BMW aren't the premium brand they aspire to be. On looks alone, both inside and out, this new X3 is simply miles behind the attractive and utterly desirable styling of a Velar, F-Pace or Stelvio. The X3 not only looks dull (as per the BMW norm) but it neither looks even remotely attractive or fresh and it already looks old. This won't date very well. You're right with your conclusions in terms of the new X3 looks both inside and out. However, there is huge market that are drawn to 'semi-premium' mass manufacturers. Those that position themselves above the Fords and VWs, but below Range Rover and Porsche. Let's not forget that BMW sells more cars than Range Rover, Porsche, and Jaguar combined. The strength of BMWs strategy over the last 20 years to move slightly downmarket, sell more cars, create a distinctive, consistent design and expand into different markets, is undeniable. SO enter a BMW dealership and you will see 1 Series, 5 Series, 7 Series, X1, 2 Series, X5 etc - they have a consistent design employed both internally and externally. The BMW brand is communicated via consistent values adopted in all their products. Strategically, the BMW decision makers in the mid 90s felt that the BMW brand - in isolation- is flexible enough to accommodate cars at £18K and bigger cars, adopting the same design ideas, at £150K. No strategy is ever full proof and purely advantageous. The down side to this is that other manufacturers have taken a different view and have begun to steal BMWs thunder. The new Velar, sitting perfectly with the Range Rover range alongside the Evoque (now beginning to look dated), RRS and RR, has a continuity of design with the exterior and interior that is rare in a 4x4. It not only fits nicely in terms of size between the Evoque and RRS, but the Velar has its own character. It's own identity. It freshness and individuality and its own strengths above and beyond its size. As for the name? Just like the 'Macan' for Porsche, 'Velar' is absolutely bang on. It seems as if the current crop of SUV model names take their inspiration from the TV series "Minder". Rugby player in a suit. what tosh will they come up with next time?